Take in the historic highlights of the Ukrainian capital on this private 3-hour walking tour of Kiev. See landmarks including the Golden Gates, St. Michael’s Golden Domed Cathedral, and the Princess Olha Monument; explore the atmospheric Old Town and learn how it was built by Prince Vladimir the Great; and marvel the UNESCO-listed St. Sophia Cathedral. 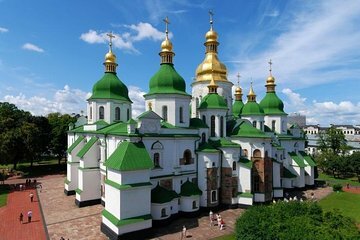 I booked two private walking tours in Kiev, one was the Ancient Kiev and City Center and the Other was the Architectural Masterpieces of Pechersk District. I had the same guide both days and she met me at my hotel both days. She introduced me to the metro system in Kiev as well as showed me all around this beautiful city. We also spent ample time at a street market for souvenir shopping. There was never a dull moment and both tours were very informative. Very cultural! I would highly recommend Green Tours for these walking tours.